Time has passed so fast. Davin is 9 months now. 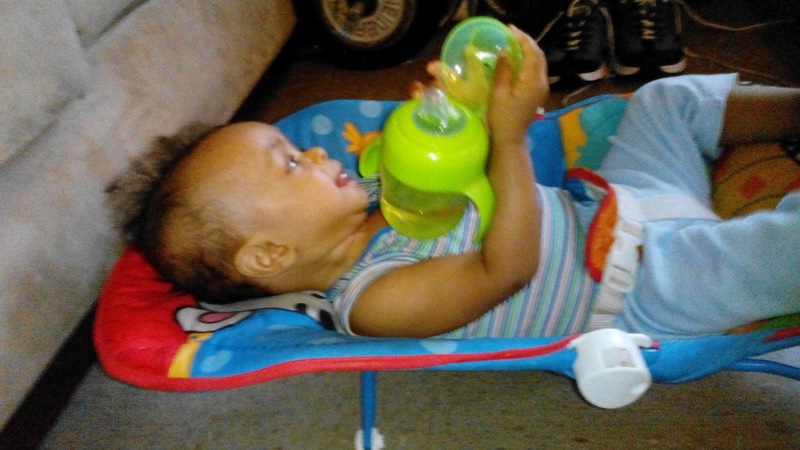 It's time for our son to get off the baby bottle and use a cup. We've been looking for a training cup for him. We know he needs to learn how to drink and hold a cup. It's not easy from going to a bottle and then a cup. Philips AVENT has just the cups for our son. Philips AVENT has the Spout Cup and Natural Drinking Cup. The cup helps us train him and get him use to drinking in a cup. We love both of the cups have handles for him to hold it. This helps transition him more into independent drinking. 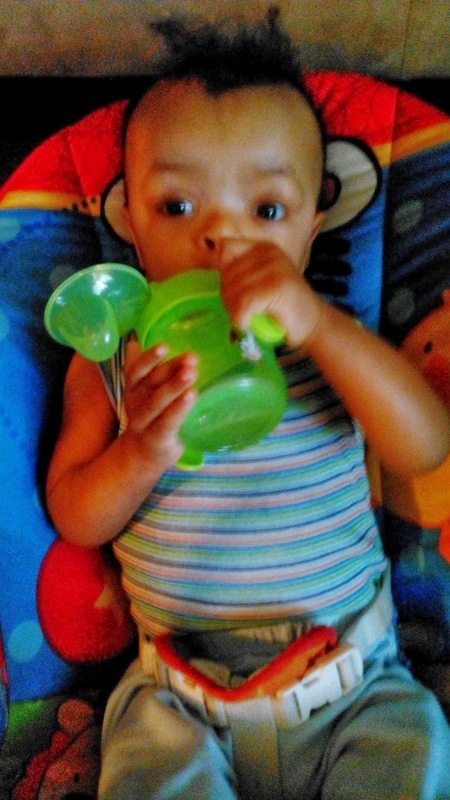 Davin tried the Philips AVENT Spout Cup. He drank some apple juice from it. He's has to get use to the cup. It will take him a few more tries. Eventually, he'll learn no more baby bottle. It's his cup from now on. I didn't like the snap-top lid. It kept getting on Davin's face. I just took it off. It's better without it, while he's drinking. After he's done drinking. It can be snapped back on. The Philips AVENT Spout Cup is spill-spoof. The cup has is soft and flexible spout for easy drinking and measurement scale. The non-spill soft spout has patented valve and snap-top lid to keep spout clean. The cup can be interchangeable with the entire Philips AVENT range. It easy to clean because it sterilizer and dishwasher safe. It's available for 6+ months in colors pink, blue and greens. The Philips AVENT Spout Cup retails for 1-pack 7, 9,12 oz. $4.49, 2-pack 7,9 oz. $7.99 and 2-pack 12 oz. $8.99. Find the cup in your local retailer at Babies R Us. The Philips AVENT Natural Drinking Cup has a leak-proof valve to prevent spilling. The simple touch of a child's mouth activates liquid flow. The 9oz cup is for toddler's 12+ months. 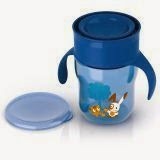 The cup is hygienic snap-on lid, dishwasher safe and BPA-free. It comes available is colors green, red, blue and pink. The retail price for Philips AVENT Natural Drinking cup is $6.99/ 1-pack and 12.99/ 2-pack. Find the cup in your local retailer at Babies R Us. Philips AVENT has an array of different products. Find out what other children's products Philips AVENT has available at www.philips.us/avent. For deals and products like them on Facebook and follow them of Twitter. Philip AVENT has offered to giveaway a Philips AVENT Natural Drinking Cup and Philips AVENT Spout Cup for one of the readers. The giveaway is open to US only and 18+ years of age. Enter the giveaway via Rafflecopter form. If you can't see form refresh your page. Disclaimer: ReviewIt PR was not compensated for this post. We received Philips AVENT products in-exchange for this review and giveaway. We gave our honest experience in this review and is our own. We are disclosing this accordance with Federal Trade Commission's 16 CFR, Part 255: "Guide Concerning the Use of Endorsements and Testimonials in Advertising. Do you want to have your product featured email us at reviewitpr@gmail.com. I love the toddler natural drinking cup. I havent used them yet and just saw them for the first timer recently but they look awesome! I love the BPA free baby mealtime set! I would love to have any of the toddler mealtime sets. I love that they offer natural products as well! I would love to have microwave steam sterilizer :) Thanks for the chance at winning! I would love the microwave steam sterilizer! thank you for the chance to win! I like the straw cups with the twist lid. I like the big toddler bowls with the cute little character in them. I like the Digital Video Baby Monitor. I like the Satinelle Ladyshave. I like the 9oz spill proof cup in yellow. I would love to have the Freeflow pacifiers. 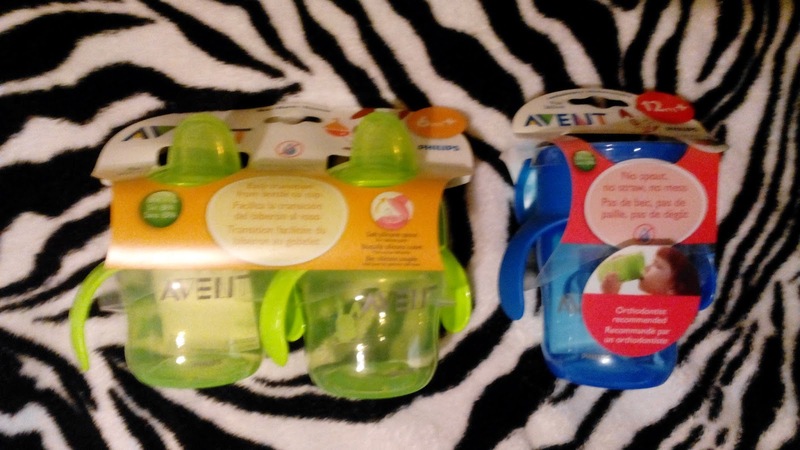 Since this is my first baby I would love to win the AVENT Breast Milk Containers! The toddler feeding set, fork and spoon. Need an extra set for my home when the grandkids come over. I love the toddler mealtime sets! I also like the straw cups. I would love to have the Essentials Baby Gift Set. Definitely one of their sippy cups. My son is 8 months old and we need to start transitioning him! I like the sterilizing baby feeding equipment.